Prepare for Halloween by understanding more about the sucrose (sugar!) in candy and doing a few candy-based experiments. -Be sure to give parents advance warning of this program in case of food allergies. -Try the Candy Chromatography experiment for yourself, so that you can better help the kids do the experiment properly. -We rewrote the instructions for Candy Chromatography from Cool Science, based on our test of the experiment. If you do that, one note: make sure to specify which end of the filter they should be “measuring up” from! We didn’t have a demo piece available, so this led to much confusion. Also, it would definitely be helpful to add photos to the instructions. -Print out copies of the Pop Rocks Balloons Prediction Sheet and the Dissolving Candy Prediction Sheet (1 of each per participant). -Cut all but two of the gummy worms in the package into as thin of strips as possible. Put the two whole gummy worms aside for the dissolving candy experiment. of baking soda into a tall, plastic cup of water. Add the thin gummy worm strips and stir. Let soak until you’re ready for the Frankenworms demo. -Fill a tall glass jar with vinegar for the Frankenworms demo. -Set up supplies for Candy Chromatography for each participant’s seat: 1 large coffee filter, 1 pencil, 1 half-sheet aluminum foil, 1 eyedropper, and 1 small plate with 5 Skittles (each a different color) and 5 toothpicks on it. -Line up the Pop Rocks Balloon demo supplies so you’re ready to rock! …pun only sort of intended. -Fill 9 clear plastic cups halfway with vinegar and 9 clear plastic cups halfway with water for the Dissolving Candy demo. Make sure you know which ones are which. -If you still have time, open up and unwrap all the candy you will use for the Dissolving Candy demo. Explain that sugar is “sucrose,” and that sucrose is a molecule. InfoPlease has a very tidy explanation of what molecules are under “Basic Elements.” Briefly explain that every molecule has a chemical formula and write the formula for sucrose on a whiteboard. Ask if anyone can identify the elements of sucrose, and see if they can figure out what the numbers mean. You can also correlate the chemical formula to a graphic representation of the molecule, such as the one found on Exploratorium’s What is Sugar page. Explain that sucrose molecules naturally arrange themselves neatly into little crystalline shapes. This is important to know when you’re cooking candy. Explain the science behind the candy-making process–starting with adding sugar to water, adding heat to the sugar-water solution, and the different stages of cooking the sugar-water solution. 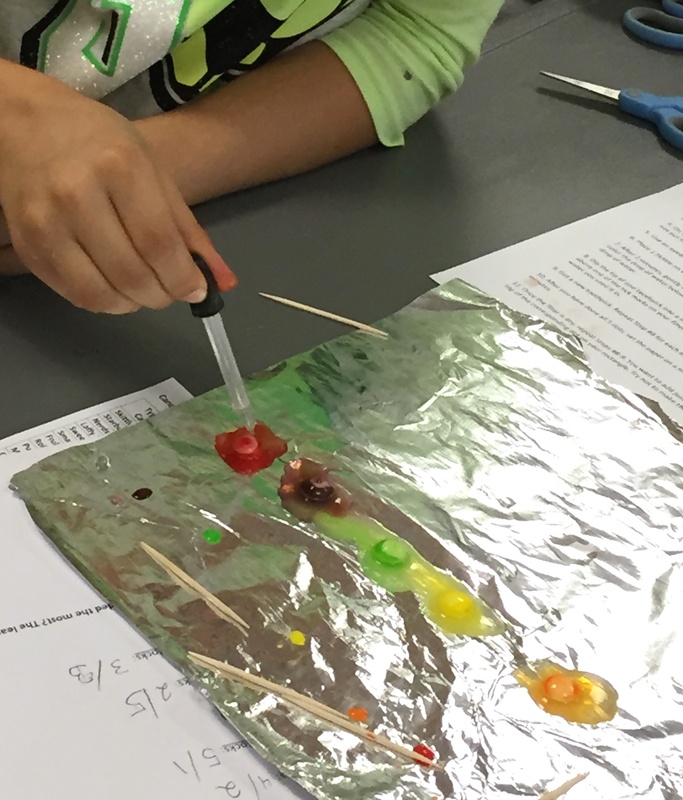 We used a combination of resources to form our explanation–most notably, the ones from ACS, Yale-New Haven Teachers Institute, InfoPlease, and both the science of candy and the stages of candymaking from the Exploratorium. Make sure to talk about the recrystallization process (supersaturation) once the sugar-water solution begins to cool down–both when that may be desirable/undesirable, and how to prevent it from happening. After you watch 2:15-11:30 of the Steve Spangler video, mention that eating sugar in moderation is OK, but that it can be really hazardous to your health in large amounts over time. These resources from Harvard Health Publications and Live Science may be useful in a brief discussion about this issue. sweet tarts, smarties, fruit-flavored tootsie rolls, pumpkin mellocremes, and 1 gummy worm per glass. Before we put the candy into their respective glasses, participants were asked to guess at which minute mark the various candies would dissolve in both water and vinegar on Dissolving Candy Prediction Sheets. The sheets also included space on the back for other observations. We watched for a minute or two to see what began to happen immediately, but then led them away for other experiments. Participants were invited to go back any time they wanted during the program to check on the progress of the candies. We made sure they all checked out what happened to the candies before they left. This fun demonstration comes from Steve Spangler Science. We predetermined which flavors of pop rocks would go into which type of soda and made Pop Rocks Balloons Prediction Sheets for the kids to guess which combination would inflate the balloons the most. For this sheet, they were supposed to rank their guesses 1-5 (most to least inflation). 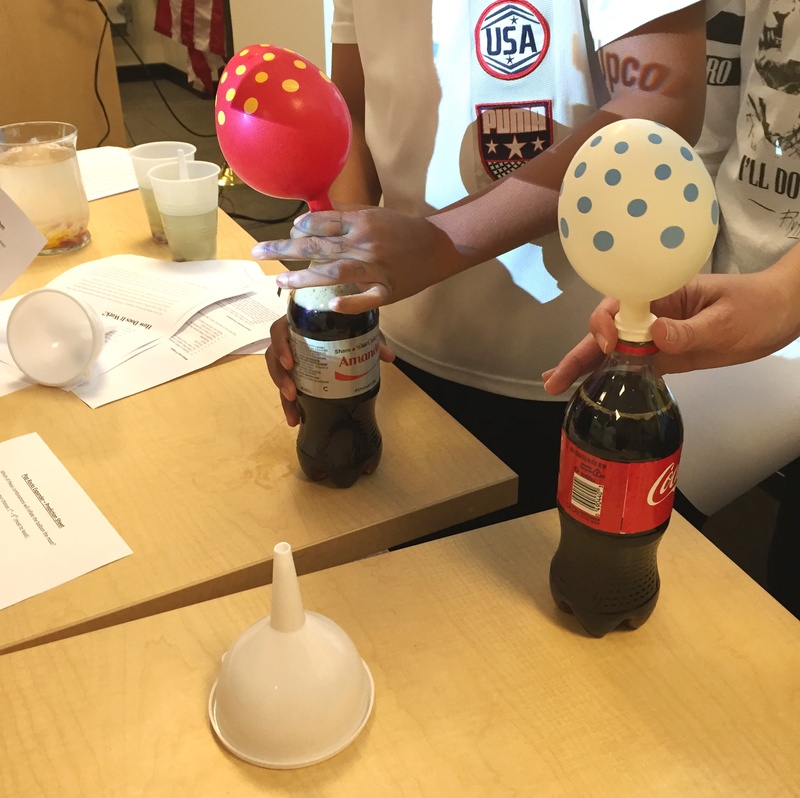 At this point in the program, our participants really wanted to get hands-on, so we had two sets of 5 volunteers: 1 set for filling the balloons with pop rocks, 1 set for attaching the balloons and releasing the pop rocks into the soda. Both this demo and the Frankenworms demo took much longer than the 5 minutes we anticipated. Not because of copmplications, but because our particiants were mesmerized by the Frankenworms and tickled pink by the Pop Rocks Balloons. Prior to beginning this experiment, we briefly explained chromatography. Our explanation was formed from Cool Science, Instructables, Scientific American, Wisc.edu, Education.com, and Explain That Stuff. We wanted the kids to do this entire experiment on their own–even measuring and cutting out the strip from the coffee filter. So, we rewrote the instructions from Cool Science (making sure we understood everything with the help of this great, picture-filled explanation from Instructables), and told the participants that they were to follow the written directions step by step. The only major change we made was that we double and pre-mixed the saltwater solution in a pitcher, which we went around and poured for the kids. We also took Cool Science’s tip to use a Sharpie to mark the outside of the cup where the coffee filter ends. This was extremely helpful when we poured the water into their cups. Exploratorium: Science of Candy: What is Sugar? Live Science: Why is Too Much Sugar Bad For You? Steve Spangler Science: Density in Action: Can You Sink a Marshmallow? Science Buddies: Candy Chromatography: What Makes Those Colors? uld be avoided by doing this project before all of the demos (except the Dissolving Candy demo, which needs time to work its gross magic), and doing whichever demos we can get to afterward. Alternately, some time could be saved by pre-cutting the filter strips and making the pencil marks on the filters in advance of the program–that is what seemed to take them the most time. Though the Pop Rocks Balloons prediction sheet went over well, the Dissolving Candy prediction sheet seemed to be a bit more confusing. In the future, we would likely change the Dissolving Candy prediction sheet to be a simple ranking of which will dissolve first, like the Pop Rocks Balloons sheet. Originally, we intended to include free building with jelly pumpkins at the end of the program. We were going to divide the group into 3 teams and task them with building the tallest free-standing toothpick-and-jelly-pumpkin structure they could. But we didn’t have enough time! Still, this project in particular would be ideal for a younger audience. 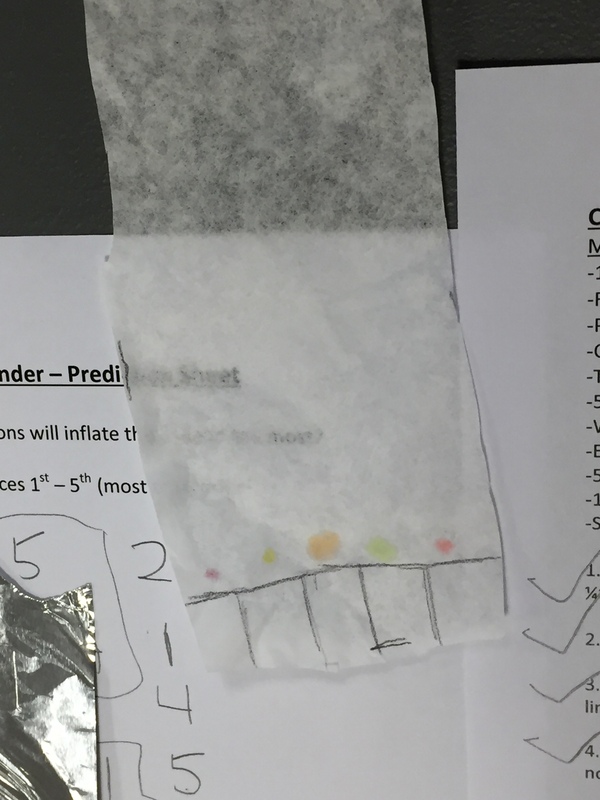 You could do a simpler chromatography project, like this one that only involves a black jellybean and plain water from Steve Spangler Science. We would also suggest the marshmallow-based Density in Action project for a younger audience, since they seem to genuinely enjoy buoyancy experiments. « Week Twenty-One: Scientists Read!